Did you know that eight percent of children and two percent of all Americans have at least one food allergy?Food Allergy Aid is dedicated to providing a meaningful resource to these people and their loved ones to keep these potentially life-threating allergies managable. If you have ANY additional comments, please leave them under the "comments" section below. Thanks for taking the survey!! Please submit any stories about you or your child's food allergies. We would love to hear stories, advice, or anything related to food allergies! It always helps other to know that someone else has "been there, done that!" Rice Chex - NOW Gluten Free! My son loves Rice Chex and has been eating them since he was 7 months old. I found it interesting the other day when I bought a new box. It has on the side panel that it is "Now Gluten-Free". When I checked he ingredients, I realized that they have removed the "Barley Malt Extract" ingredient which is the ingredient that would include gluten. It now includes molasses instead! Gluten is not tolerated by many people - especially those individuals with Celiac Disease. Gluten may be found in barley, wheat, oats, etc. 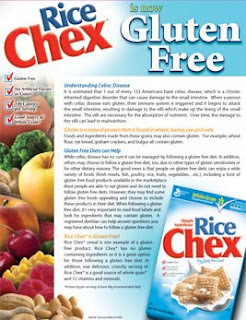 Check out this article from General Mills and check out new Gluten-Free Rice Chex in stores now! Check Out Divvies for Halloween! Check out Divvies for some yummy allergy-free Halloween treats! You're sure to find something for everyone - even those without food allergies! I have tried their products before and they are fantastic!! Our son has eaten the same chicken breast at a restuarat that we trust for about 4 years now. He has severe allergies still to wheat, milk, egg, and peanut - he used to also have corn and soy. Well, my husband and I always ordered him a "plain" chicken breast almost every time we visited. About two weeks ago, the manager told me that he noticed that the chicken breast was not on their "gluten free" list. Interesting! Well, apparently the chicken breasts are pre-marinted with a LONG list of ingredients including a "contains: wheat and soy" disclaimer. We were shocked! He usually broke out in some red spots on his face after he ate there but we just assumed it was nothing - he has very sensitive skin and breaks out in splotches for no reason sometimes! Although, I did have to give him benadryl after one visit. The lesson learned: always ask about whether or not meat is marinated - never assume that it is just meat. 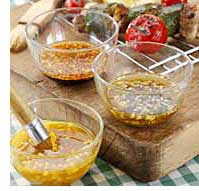 Marinades may contain ANY of the top allergens including wheat, soy, peanut, sesame, etc. Always be safe and ask! 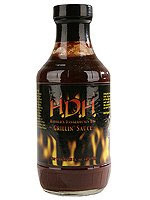 September 24, 2008 CaJohns Fiery Foods Company is recalling "HDH Grillin Sauce" due to undeclared anchovy, soy, and wheat. The product was distributed nationwide through retailers, mail order, and websites. The product is in 16-oz. glass bottles with lot numbers 249154, 249181, 249197, 249242, 249298, and 249304. Consumers with questions may call (888) 703-3473. Enjoy Life Food has done it again! They have created a "milk" chocolate bar that is free of ALL common allergens. It is made with rice milk. They have 3 delicious choices: cripsy rice bar, dark chocolate, and milk bar. They are taste tested by my 5-year-old and they pass with 2 thumbs WAY up. He loves them and eats them daily. 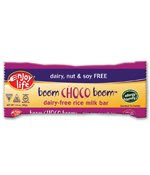 Enjoy Life is offering $0.75 off the new chocolate bars with their coupon that you can download at their site. They also have another coupon that you can download on their home page for $0.55 off their products. 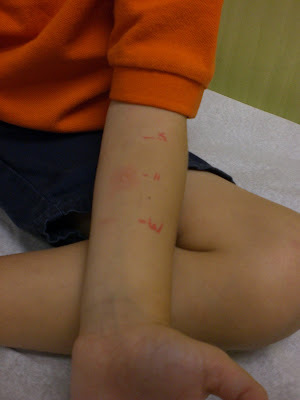 My son had an anaphylactic reaction to wheat when he was around 18 months old. He has been on a strict elimination diet since he was diagnosed with multiple food allergies at 7 months of age. As we follow his blood work RAST testing every 6 months to yearly, we have watched his "classes" go down. As his classes go down, we test him to see if some of the allergens have been outgrown. He has outgrown 3 so far - soy, oats, and corn. Well, his blood work for soy was still a class 2 but his oral challenge went well and he tolerates soy just fine now! 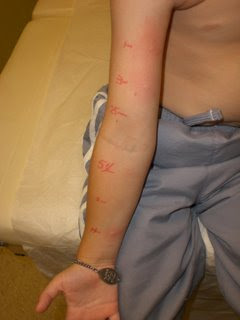 You can actually have a + skin test even after an allergy is outgrown - there is no black and white with food allergies. His wheat RAST is still a class 2 but his recent skin test was NEGATIVE! He is now 5 years old. So, we will be doing another oral challenge. So, keep the faith - things do get better! With my son's newfound love of soy (he passed his oral challenge - yay!! ), we have a new world with unchartered territory in front of us! We ventured out to Whole Foods and spent an obscene amount of money on soy products. This is one of the ones that he loved. His allergies that remain are wheat, milk, egg, peanut, oat, and green pea. In case you were wondering about skin testing, here is an example. In the top picture, this is testing for 1) milk, 3) egg, 25) oats, 54) soy, and a (s) saline and (h) histamine. The second picture shows + results to milk and egg. Oat was negative. Soy was also a small +. The histamine is + but it should be because it is the control and shows that there is a normal reaction to histamine. When histamine is released, it can cause itching, redness, hives, etc. You are intentionally pricked with histamine to make sure it is + to ensure that the test results are valid. For example, if you were taking zyrtec regularly (a histamine BLOCKER), the histamine skin test would be negative. It would also mean that you may not turn up + for foods that you may be + to making the results invalid. in contrast, the saline should be negative because a person should not react to simple normal saline. There are instances where people do react to saline, though. 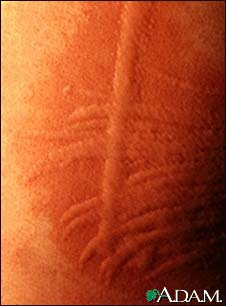 Some people are "dermatographic" which means that a whelp may develop simply by pricking skin. For example, if an object is scraped on your arm in a straight line, you will develop a "straight line" whelp. This would mean that you are dematrographic and it is unlikely that skin testing would work for you - you would probably react to everything although they would not be considered +. My family recently went on vacation with our severely-food-allergic 4-year-old. We dine out for basically all meals when we are out of town. This, however, presents challenges when you have a child that is allergic to wheat, milk, eggs, soy, peanuts, oats, and green peas. I also have peanut and sesame allergies. We are always cautious and try to go to the same places if we can find them. My husband had taken my son to Hard Rock in our hometown and had very good luck with them and felt confident in their abiliy to deal with food allergies. We were able to find a Hard Rock Cafe in downtown Nashville and tried it out for lunch. The waiters and general manager were incredibly helpful and our lunch was wonderful! They answered all of our questions and went to the kitchen numerous times to get any information that we needed to feel comfortable! 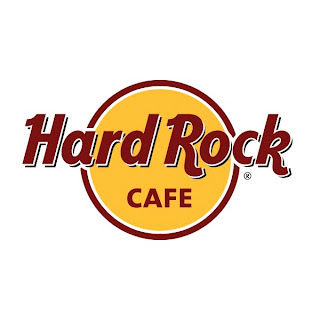 So, we have had two wonderful meals with Hard Rock. The best part is that their menu denotes menu items that "contain seeds or nuts". It makes me so happy to see companies that are aware that food allergies are important and wide-spread. Kudos to Hard Rock Cafe! As food allergy sufferers, I am sure that most of you have dicovered Whole Foods Market. One of our best friends jokes that it should be called "Whole Paycheck". Seriously, though, thank God for this store! As many of you know, Whole Foods sells many retail products that are specifically for dietary needs of all sorts - food allergies included. Each store carries different items. They even have gluten-free bakery items in the stores. In fact, check out their site http://www.wholefoodsmarket.com/. Click on "special diets" under the "Whole Body" tab, then click on "Special Diets" on the left side of the page. There is information on their page regarding special dietary needs and helpful information for shopping on their store. I ran across this company just today and it looks fantastic. The only thing that makes me sad is that they are not in New Orleans or Louisiana for that matter! They make soy ice cream that is free of dairy, egg, tree nuts and peanuts. Their products are also vegan and kosher. They sell ice cream in a large vaiety of flavors, "treese" soy cheese, pumpkin pie with gluten free crust, and soft serve mixes. Give these guys a shot! They have a very worthy cause here! I came across this very disturbing article. 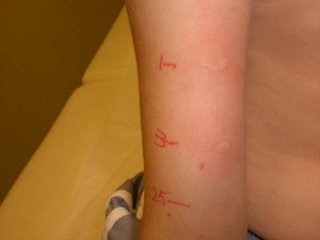 As if children and teens do not have a hard enough time making people aware of their allergies for survival, they are now having their food allergies used against them! 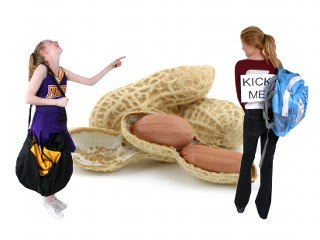 Kids are actually using allergens to bully these children. Please take advantage of our online coupons to the right of the page. There are more online coupons in the works to be added to our page. Currently, we have online coupons for Liberty Bakery and Miss Roben's. Click on the link to the right of the page. Upon checkout, enter the coupon code to receive you discount :) It's that easy! I think this is a very interesting and innovative product! These are temporary tattoos that display a medical condition such as a food allergy! They last approximately 12 hours if applied properly. The company recommends uses such as: childcare facilities, traveling, or anything that requires being away from home or school. They can be used for adults and children. 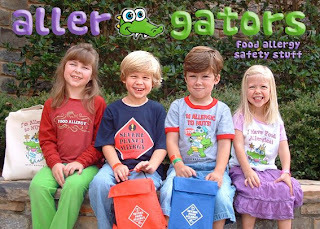 This is a really cute site that sells a variety of food allergy safety / awareness products - shirts, wristbands, etc. The shirts are really cute! 10% of all profits from this site is donated to the Food Allergy and Anaphylaxis Network! Check them out and support food allergy awareness and research! These are the pancakes that I made this morning - I apologize for the non-decorative plate! 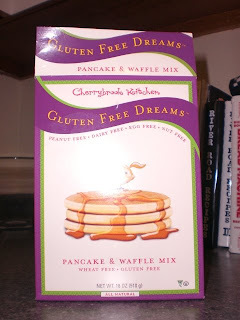 wheat free/gluten free pancake and waffle mix. We were really excited to find it because our Whole Foods does not carry it! All that we added was rice milk and canola oil. 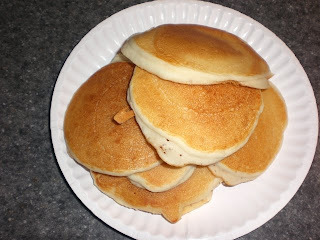 The pancakes came out fluffy and browned VERY well. The best part is - the pancakes were not gummy at all! I encourage you to try this mix! It's great! With Easter quickly approaching, chocolate surrounds us! 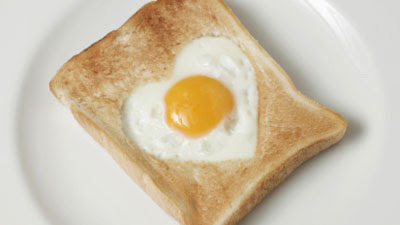 Easter can also be fear-provoking for parents and others with life-threatening food allergies. Easter tends to particularly like peanut butter, too. Hershey's is allergy-conscious and a trustworthy source of allergen labeling. On their web site, they have a section that explains an 'adverse reaction'. "How does The Hershey Company manage allergies? The Hershey Company strives to provide its consumers with accurate, reliable ingredient statements upon which consumers can make their purchase decision. The Hershey Company has an Allergy Task Force that ensures that the ingredient statements are always accurate, and that any allergen statements placed on the label is understandable." "Do your products share plants & equipment? We take food allergies very seriously at Hershey and have strict procedures in place to prevent crossover of allergens into other products that do not contain the allergen. In instances where we have a concern about possible crossover by an allergen we take the added precaution of including an allergy information statement on the label." Allergy Free Foods is a great site that has many allergy free foods that include allergy free cheeses, gravies, cookies, bread, etc. The only downside is that I cannot find where they list ingedients. I am cautious of ordering and paying for shipping only to find out that it cannot be used. They do, however, have contact information for questions. Check them out! According to www.Random.org, our winner of "Great Foods Without Worry" is Melanie! Congratulations, Melanie! Your copy of this great book of recipes will be on its way soon! Check back often for another great giveaway! Submit recipes, stories, information, articles, products, or anything that you would like to share or be a blog spotlight! The information contained in this web site is to provide everyday tips to make food allergies manageable. This information is in no way meant to replace the advice of a physician other health care provider. Please seek the advice of a physician for individual health care needs.